"Whoever dares to tamper with myths is moving in a realm beyond the reach of reason." Only a few bells can be heard beyond the walls of the orange dome tent. The sounds mark the spot down the sandy moraine where the yaks lie after dusk, the bells hung round their necks, facing the light breeze coming off Everest. 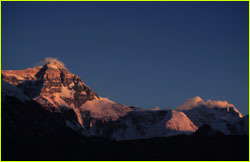 It's late and the climbers and Sherpas are all asleep in their tents, resting at Base Camp before the next push up the mountain. With every day comes new information about Mallory and Irvine that forces us to reexamine what we think we know, the evidence that we have, and our own sense of reason. There are so many pieces to this puzzle and our impression is that they are being examined on a worldwide scale. Today, during an interview with the London Sunday Times, I learned that a letter had been written to the newspaper by a friend of Sir Percy Wyn Harris, the climber who in 1933 found the ice axe at 27,500 feet on Everest. After years of conjecture, it has been assumed that the ice axe was Irvine's because it has nicks on the handle. Irvine was known to put these distinct markings on all his belongings. 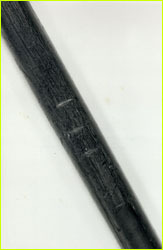 The markings on the Ice Axe found in 1933 at 27,500 feet. "When I picked up the axe there was no mark on it. The cross, over which there has been so much controversy, was not put on either by Mallory or Irvine. It was in fact cut by my personal Sherpa porter, Kusang Pugla, who did it under threats from me that it must not be lost or mixed up with other axes." I looked closer and couldn't believe the irony: Wyn Harris' quote was from, of all papers, the Sunday Times, 17 October 1971. All the pieces don't quite fit together, because while Harris describes "crosses," the marks on the ice axe in question are clearly straight lines. So is this one more clue that leads us back to Mallory, or not? Could the ice axe have belonged to him? If so, where is Irvine? And if they were roped together and fell together, is Irvine somewhere above or below Mallory? Or did Irvine survive an initial fall with Mallory, the break in their rope severing them forever? Our climbers searched to the west of the old Chinese Camp VI site where a body, presumed to be Irvine's, was found face up with a hole pecked out of a cheek in 1975. On their next search, the team will also look to the east of the Chinese Camp VI, a more level area where Irvine, perhaps injured and exhausted, sat down to die. "At 12:50 p.m. M & I on ridge nearing base of final pyramide." This was originally presumed to mean the Second Step. Odell later commented that he saw them surmount the step in five minutes. But then, he modified his observations, adamantly reporting that he saw them on the First Step. In 1990, Everest historian Audrey Salkeld began considering whether Odell had in fact been referring to the Third Step, a small feature at the base of the final pyramid. In an effort to determine whether an observer could mistake one step for another, Politz climbed to Odell's observation point and photographed the steps with a 50-mm lens. "From where I stood I could see the three steps," said Politz on camera. "Odell was supposed to have seen them climb to the top of one of the steps in five minutes' time. And the question is whether from that perspective the steps all lined up or separated significantly enough. Could they have been confused with the Second and the Third Step? Well, I'll tell you, you're so magnetically drawn to the view and those three steps are definitely separated from that perspective. I have no doubt that he saw them on the Third Step. I think it's very obvious. What he described is clearly easy to define, even when the clouds part and you have just a few seconds of observation. And the summit pyramid stacked right behind that step that these guys climbed." At 12:50 p.m., when Odell saw Mallory and Irvine for the last time, they may have been climbing the Third Step—approximately just two hours away from reaching the summit. With the climbers' recent discovery of a pair of sun goggles in Mallory's pocket, it is easy to assume he had taken his goggles off as the light waned. And if it takes at least five hours to descend from the summit back to high camp, Mallory and Irvine could have been descending in the dark, aiming to reach camp at about 9:00 p.m.
With each day come new ideas and more conjecture. And with each truth comes more questions. At mealtimes we discuss the many scenarios and debate the best search objectives. And by nightfall, after tampering with the myths, we have entered what Everest historian Audrey Salkeld refers to as "a realm beyond the reach of reason." Time is running out for us to learn more, with only one more chance to go high and search for answers in the thin air on the high slopes of Everest. In two days, the team begins the move back up the mountain. Read Everest historian Audrey Salkeld's response to this dispatch. Photos: (1) Liesl Clark; (2) Courtesy of the Alpine Club Library, UK; (3) From Everest: Mystery of Mallory and Irvine, Arcturus Films.